December 11, 2015 11:00 A.M.
Ontario is taking action to better protect Ontarians against diseases that can be prevented by vaccines. 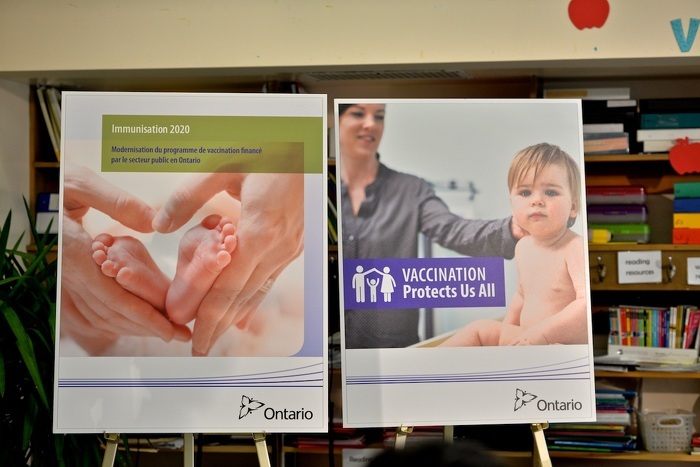 The province's new strategy, Immunization 2020, will strengthen Ontario's publicly funded immunization program over the next five years. 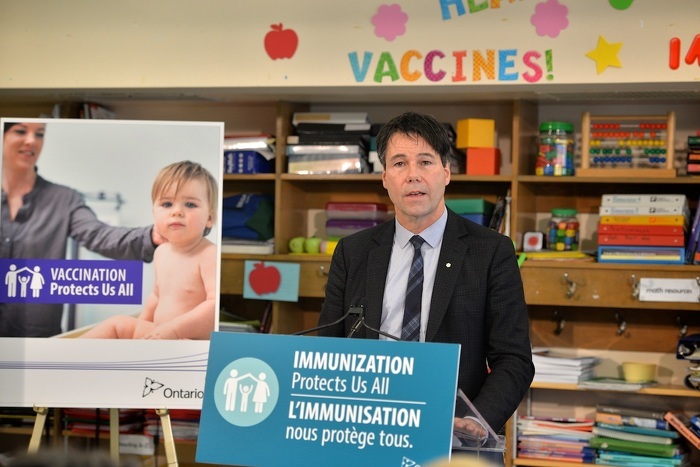 As part of the strategy, Ontario will be proposing changes to the Immunization of School Pupils Act that, if passed, would include stronger requirements for school vaccine exemptions. Under the proposed legislative changes, parents and guardians who are considering not to immunize their children would need to participate in an education session delivered by their local public health unit in order to obtain a vaccine exemption for non-medical reasons. If passed, the proposed changes to the Immunization School Pupils Act would come into effect for the 2016-17 school year. Seek to offer additional vaccines and catch-up programs to children and youth through school-based clinics; and increase access to vaccines for adults and seniors through settings like Community Health Centres and hospitals before a patient is discharged. Launch a public education campaign on the importance of immunization, so people can make informed decisions based on facts and evidence. Create online resources that provide the latest research about vaccines, vaccine-preventable diseases, immunization programs, and advice on how to have positive immunization experiences for parents and kids. Look at ways to improve public reporting on local vaccine coverage rates (such as by public health units, schools or school boards). Explore ways for Ontarians to get their immunization records through a secure, online portal. Ontario will also explore ways to link Panorama to other electronic record systems to better collect and analyze vaccine coverage. Develop a comprehensive mechanism to monitor the performance of Ontario's immunization system and progress in carrying out the 20 actions in Immunization 2020. Strengthening Ontario's publicly funded immunization program is part of the government's plan to build a better Ontario through its Patients First: Action Plan for Health Care, which provides patients with faster access to the right care; better home and community care; the information they need to live healthy; and a health care system that is sustainable for generations to come. Thanks to vaccines, infectious diseases that were the leading cause of death worldwide 100 years ago are now the cause of less than five per cent of all deaths in Canada. In 1982, Ontario was first in Canada to introduce school immunization laws requiring children to be vaccinated against certain diseases in order to attend school, unless they have a valid exemption. Immunization 2020 reflects the findings of the Advisory Committee for Ontario’s Immunization System Review. It also reflects recommendations made in the Auditor General of Ontario’s 2014 Annual Report. This document was published on December 11, 2015 and is provided for archival and research purposes. 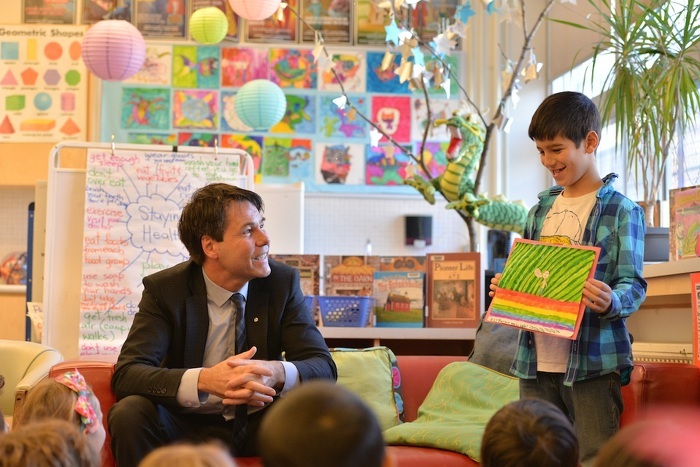 Minister Hoskins speaking with students of the event.